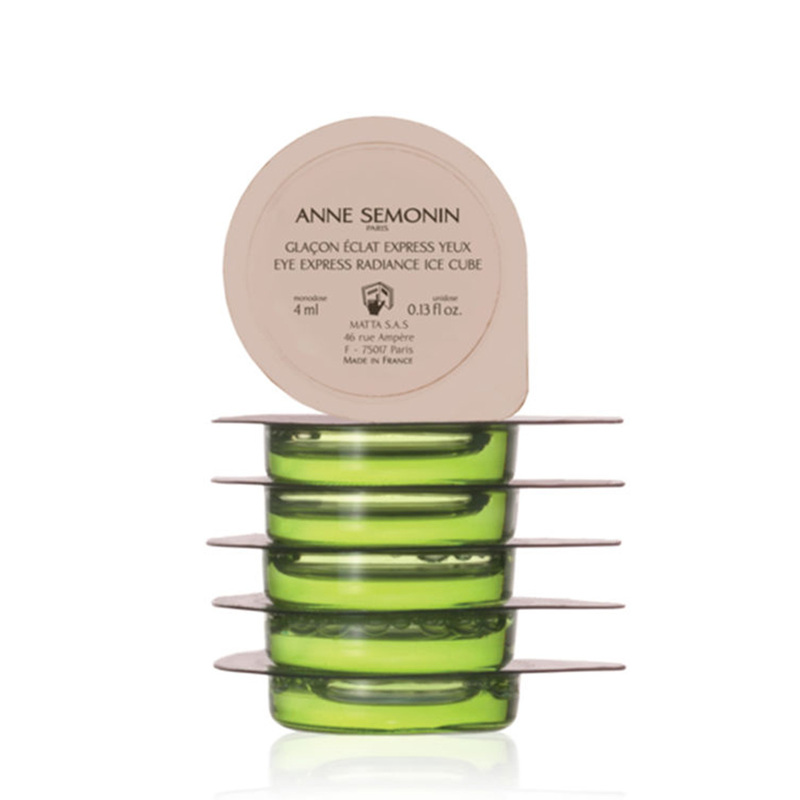 These innovative Eye Express Radiance Ice Cubes are specifically developed for the delicate eye area. The Eye Express Radiance Ice Cubes contain natural active ingredients such as Ginkgo biloba, gourd extract and hyaluronic acid: the best beauty secret to maintain radiance, refresh tired & puffy eyes under any circumstances. The ice cubes should be stored in your freezer (for a minimum of 3 hours). Before use, remove one ice cube from the freezer, turn it out of its mould and wrap it in the gauze provided. In the morning and/or prior to going out in the evening, sweep around the eye contour in a circular motion, then under the eye area to the nose. Repeat the process on the opposite eye. -Marine Spring Water: rich in trace elements and mineral salts, hydrating, revitalising and remineralising. MARIS AQUA (SEA WATER)/EAU DE MER, AQUA (WATER)/EAU, POLYSORBATE 20, GLUCOSYL HESPERIDIN, BENZYL ALCOHOL, BUTYLENE GLYCOL, GLYCERIN, PHENOXYETHANOL, CHLORPHENESIN, SODIUM HYALURONATE, TEPHROSIA PURPUREA SEED EXTRACT, DEHYDROACETIC ACID, GINKGO BILOBA LEAF EXTRACT, SODIUM HYDROXIDE, CUCURBITA PEPO (PUMPKIN) SEED EXTRACT, SODIUM BENZOATE, POTASSIUM SORBATE, ACETYL HEXAPEPTIDE-8, LACTIC ACID, CI 42090 (BLUE 1). I was so excited to try these after watching a couple of reviews. I’ve used ice cubes on my face and eye area for a while when I’m feeling tired and puffy so I know it makes a big difference so was keen to see how good something other than just water was. I didn’t really find these did any more than a normal ice cube so in that respect I think they’re very expensive. I do love how convenient they are though - the packaging and he little bags for each ice sachet is great however there is so much liquid when the ice melts I find I had to wrap the bag in a muslin or thin flannel to stop it running down my clothes. I found these work fairly good on the bags under my eyes but I have less expensive eye gels that do the same and are much cheaper! I'll use these up but probably won't buy more. This product definitely seemed interesting and novel, but in the end it's just not something I'd spend money on. The "ice cubes" are much tinier than I expected and they melt very fast. In fact they melt so fast I wound up with cold liquid running down my face. I'd say they were completely dissolved in about three minutes. I did think there was a slight but temporary improvement around my eyes, but the process was neither fun nor relaxing and the results don't last. I'd rather spend money on eye cream or eye masks instead. Easy to use, quick fix to wake up!! The pads are a quite interesting idea. They do help with puffy eyes because of the temperature but messy and irritating if the product enters your eyes (That would explain the 3 stars). Good for days with important meeting giving you the assurance that you have done everything in your power to look your best. I would buy them again though!